TO PURCHASE (SINGLE PIECES) VISIT OUR "SHOPING CART" PAGE FOR COST AND AVAILABILITY. If you are interested in learning about Chu-Bops you've come to the right place. If you are a seasoned collector you can simply scroll down to start your Bopin' and Shoppin' spree !!. There are several links on our site related to such artists as Elvis , The Rolling Stones, and The Beatles just to name a few Rock/Pop and Soul artists of that time and era. All these mini gums came in series numbers of artists gums. These Album Gums came in a "Boxed Set" which was placed on the merchants checkout counter as a way of the enticing customers to buy some "Bops", the same way merchants do it today as "teaser items" while waiting in line to check out. 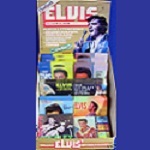 These Counter top displays were packaged for sale to the vendor in a colorful cardboard stand-up display box with each boxed set containing 64 individual mini gum albums that depicted the original album graphics of a larger LP. Throughout the lifetime of the "Bops Fad" there were several different kinds of "Gum Series", "Counter Displays" and "Volumes" manufactured by the Amurol Confection Company. Some customers opted to eat the gum and some purchased them as part of their own collection. You will see that many customers kept the "mini albums" in mint condition with the cellophane and gum that were specifically for collecting. As the popularity of the "Bops" gum albums rose, Amurol also introduced four sets of "Special Edition Collectors Album Flats". 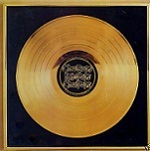 They were numbered as Volume 1, Volume 2, a generic un-numbered Volume and an Elvis "International Gold Collector’s Edition". Each individual Volume was populated by 16 mini albums. We are always looking to BUY-SELL or TRADE "Bops" or other Amurol related products or Memorabilia. Mail me with what you have and let's do some business together. You may also want to take the time to view all of the series numbers (1 through 9) and their respective artists. Please visit our Chu-Bops Series Page for a complete listing of albums and some cool music. Please check out our entire site, and order from our Shopping Cart Page.If you have any questions regarding any of the items we sell, we highly encourage you to contact us for more specific and detailed information. 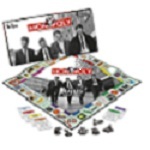 Check out our Memorabilia - Collectibles page for Beatles and Elvis games such as MONOPOLY or YAHTZEE. WARNING: DO NOT eat or place any of the gums or game pieces in your mouth.